This week saw the first official One School One Planet classroom sessions at Llanfyllin High School. We have started working with a class of 29 Year 10 Welsh Baccalaureate students, who are helping us to trial and develop our 12 unit course and learing resources. 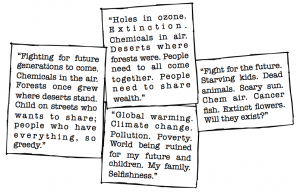 What does Climate Change mean to you? What do you know about the Paris Climate Agreement? 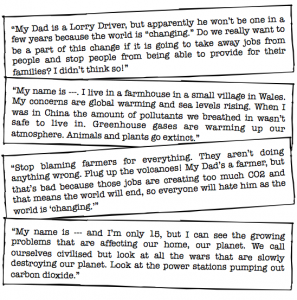 If you were in charge, what would you do about Climate Change? Some of the responses from students are collected below. They are quite revealing! 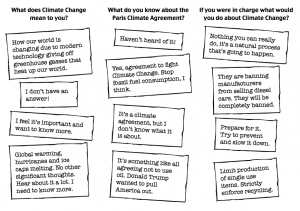 The responses we gathered on Wednesday serve as very useful baseline survey of students’ views and opinions about climate change and their awareness of strategies for dealing with it. 2. What are your concerns? 3. What solutions would you propose? We were keen to point out that what we were really interested in was their own personal concerns. What they themselves are worried about. Here are some of the ideas they came up with. Again, they are revealing of some very important issues surrounding public opinion about the need for social, cultural and economic change in addressing the eco-crisis. These are all legitimate concerns and opinions that require positive solutions. We hope that over the course of our 12 units – each covering one of the 12 principles of Permaculture – we will be able to address such concerns with practical and sustainable suggestions. Stay tuned for more updates on our project!